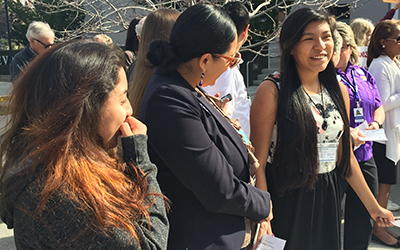 Letting their voices be heard on issues that they care about, those affecting Nevada’s women and families, a group of civic-minded Core scholars recently travelled to Carson City to proudly participate in the annual Grassroots Lobby Days. Sponsored by the Nevada Women’s Lobby in conjunction with its partners, Grassroots Lobby Days see hundreds of Nevadans gathered for two days of training, networking, lobbying, discussion, and inspiration. Participants learn the ins and outs of being a grassroots lobbyist so they can successfully raise their voices on behalf of Nevada’s women and children. Scholars Daniela, Esmeralda, Flor, Gisela, Jimena, Melissa G., Sirenia, Melissa R., Margarita, Michelle, and Jazmin, along with staff members Izzy and Julie, made the trip to learn the Nevada legislative process and how to influence it, learn about current Nevada issues affecting Nevada’s women and families, meet other Nevadans with similar concerns, meet Nevada senators and assemblypersons and attend legislative committee hearings and floor sessions with the ultimate goal of influencing legislators. In addition to participating in the activities and workshops and gaining in-depth insights on timely issues, the scholars also got a chance to take in the beautiful landscape and scenery in Carson City and share the experience with the peers. “The lobbying event was a very interesting experience, especially being able to take part in our laws and our state. 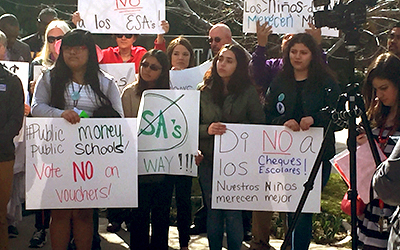 I enjoyed being able to take part in the ongoing fight for public schools. Hearing everyone’s moving speeches, especially the ones from my fellow peers demonstrates how much individuals are willing to fight for something they truly care about. Throughout the whole trip, which was only two days, I learned that an individual can make a change, but when we work together, we can make a greater change,” shared 10th grade scholar Daniela. A big thank you and congratulations to all who participated – we are so very proud!